Definition at line 154 of file SundanceStdProductTransformations.hpp. Definition at line 158 of file SundanceStdProductTransformations.hpp. Definition at line 161 of file SundanceStdProductTransformations.hpp. 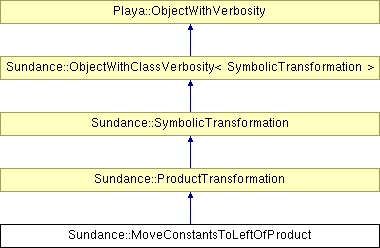 Definition at line 203 of file SundanceStdProductTransformations.cpp. References Sundance::SymbolicTransformation::getScalar(), Sundance::Expr::handle(), Playa::Out::println(), SUNDANCE_OUT, and Playa::ObjectWithVerbosity::verb().